Migration watch; 07.00 – 11.45hrs. On the move (north unless stated) were 44 Wigeon, 1 Shoveler, 18 Teal, 12 Common Scoter, 5 Red-throated Diver + 2 south, 6 Fulmar, 2 Cormorant, 1 Turnstone south, 213 Kittiwake, 6 Great Black-backed Gull, 15 Sandwich Tern + 2 south, 1 Common Tern, 7 Swallow south, 1 Flava south, 3 Grey Wagtail south, 41 Meadow Pipit south, 47 Linnet south, 9 Goldfinch south, 22 Siskin south and 1 Reed Bunting south. In the Long Nab area were 8 Chiffchaff, 3 Yellow-browed Warbler, 10 Goldcrest and 3 Lapland Bunting. 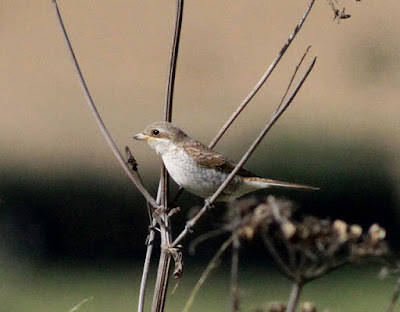 Further to the south a juvenile Red-backed Shrike was found at Cromer Point where a Jack Snipe came in off the sea. Other Yellow-browed Warblers were recorded at Scalby Lodge Pond area, the Crescent (2), at Holbeck, by the University on Filey Road and in Cornelian Bay (3) where a Lesser Whitethroat was also seen. Six Swallow and 10 House Martin were at Wykeham South Lake, 43 Wigeon were on Johnson’s Marsh and a Wheatear and a Whinchat were at Scalby Lodge Pond.